The story of home and the people in it. The visitation room at the correctional facility looked like an elementary school cafeteria that hadn’t been updated since 1974. The walls were taupe but for two bold roller-rink stripes of maroon and blue. Ola Yoder sat in the middle of the room and stood out. Crisp white short-sleeve button-down shirt tucked into black flat-front dress pants. Work-scuffed black dress shoes with black suspenders. This was Ola’s uniform. Work, leisure, meetings, Sunday church, family gatherings, prison visits. A uniform style of dress that discourages physical appearance as a source of pride, Ola and his religious community had learned that simplicity reflects universal values of humility and modesty. His Shenandoah beard and solemn gaze gave away his faith. But Ola never concerned himself much with what others think of him. He sat across from Eli Weaver with an open mind and a full heart. As he had done countless times before, Ola sought to comfort Eli and to understand what he had done. This was Ola’s fourth visit of the year. For Ola, you reach out to someone in trouble in your community and help them…and when you can’t help, you try to understand. You see, in 2009, a life had been taken — the life of a member of the community, a woman who was the mother of 5, and the wife of Eli Weaver. Hundreds of miles from Ola’s home, family, and business, the murder shook him. What would cause someone who grew up learning the ways of pacifism and peace to turn to violence and murder his wife? It just didn’t make sense. How could someone be so troubled as to murder an innocent woman, in their house, with their children present, seated in the middle of an Ohio Amish community? Hundreds of miles west, back in Nappanee, Indiana, an empire continues to grow. Dozens of semi-trailers litter the area behind locked gates. Hidden inside each, packed perfectly, are dozens of kitchen cabinets made by a company whose reputation is highly regarded by customers and vendors alike. Kountry Wood is a huge part of Ola’s legacy, though he’d never say it himself. His children, his faith, his works, his community — they would all be mentioned first, as well they should. But one cannot tell the story of Ola Yoder without understanding the beauty of his products. 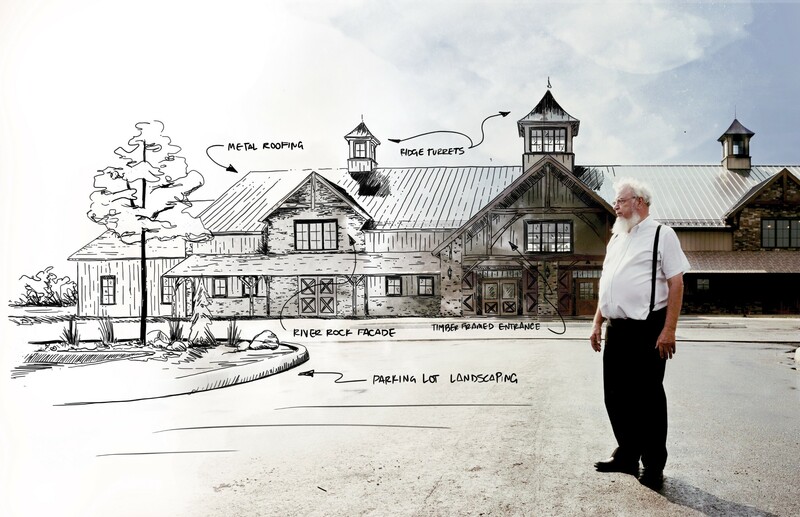 The company was started just 20 years ago in Ola’s barn. Today, it spans well over 250,000 square feet of factory floor, and it’s growing yearly. The company turns out over 1.4 million kitchen cabinets each year, with under 500 hard-working employees. A short tour around Kountry Wood would leave anyone blown away. The factory floor is clean — not clean like a standard factory floor, but immaculately clean like a hospital and biochemical lab. Skilled craftspeople delicately sand and stain at their respective stations. Between those stations runs a factory line that looks more like something that should be producing Tesla Model Xs than Nappanee’s favorite cabinetry. Laser precision guides nearly every step of the process, all the way through custom corrugated cardboard packaging built for each product. A red digital counter hangs from the middle of the ceiling reminding everyone of the day’s goals and current production numbers. Today, like most days, the factory has run so efficiently that by 3:00 p.m. the workers have surpassed production goals and only a few folks remain at work. The employees look happy to be involved. Ola doesn’t allow employees to use drugs of any sort in the workplace; in fact, he doesn’t even allow them to curse on the premises. Despite the dual monitors at every cubicle; despite the computer-guided factory floor; despite the beautiful efficiency…Kountry Wood, like everything lucky enough to be touched by Ola, is steeped to the core in his faith, and it shows. That faith, while understated by nature, is crucial. Ola Yoder is many things. A business mogul by any measure. A researcher tasked with understanding human behavior of the worst kind. A humanitarian. A human, endlessly proud of his wife and family. That faith is a common thread that can weave together all sides of the man. It’s the same faith that guided him to help those five orphans stay afloat after their mother was murdered and their father was imprisoned. It’s the same faith that comforts the man who put his children in that position — who stole their foundation and, if not for Ola’s kindness, almost stole their livelihood. There’s an Amish proverb that provides a thesis for Ola’s life: “The most important things in your home are people.” Ola, like many of his peers, believes that home goes well beyond four walls, a farm, or even a factory. That is the power of Ola’s faith. And now that faith is taking acts to a new level. Ola pulls a black, oversized handle. Hand-formed wrought iron has its own story to tell. A story of a craftsman like Ola, firing and hammering away — removing excess and shaping the remains until he finds perfection. It’s symbolic of Ola’s empire: the pull is simple, understated, without frills or excess, but it forms something beautiful. 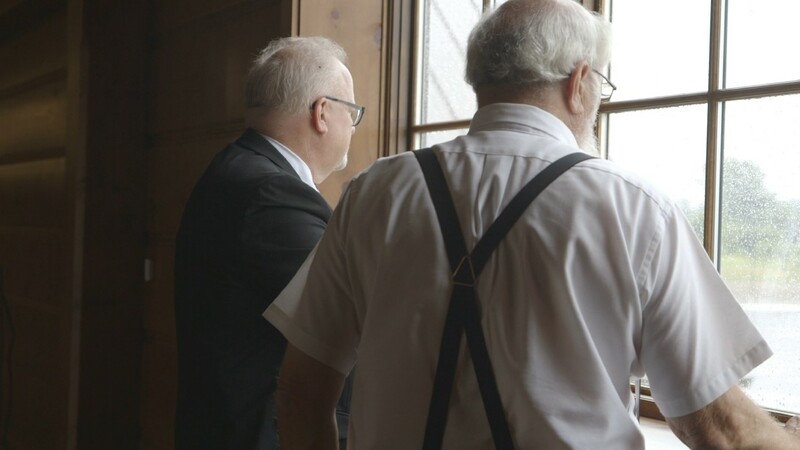 He and his longtime advisor, Brian Hoffer, walk through the oversized oaken doors. Inside is an amazing space that would drop the jaws of the most seasoned architects. Suited and put together, a lawyer focusing on finance and estate planning, Brian lets a smile break through. Who could help it? After working together since the beginning, Brian feels emotionally tied to Ola’s great work too, and he should. There is simply no reining in Ola’s philanthropic spirit. But, like the few cut from his same cloth in this world, Ola has a hard time approaching philanthropy in the same way he does business. So Brian’s recent guidance has been important in taking some big strides forward. Together with Brian’s guidance and the professionals at the Community Foundation of Elkhart County, Ola has recently opened a donor-advised fund to help him and his wife, Vera make the most of their charity. The fund allows the Yoder’s to help guide funds into the charitable projects that are most important to them, while still benefiting from the expert fund management being performed by the Foundation. 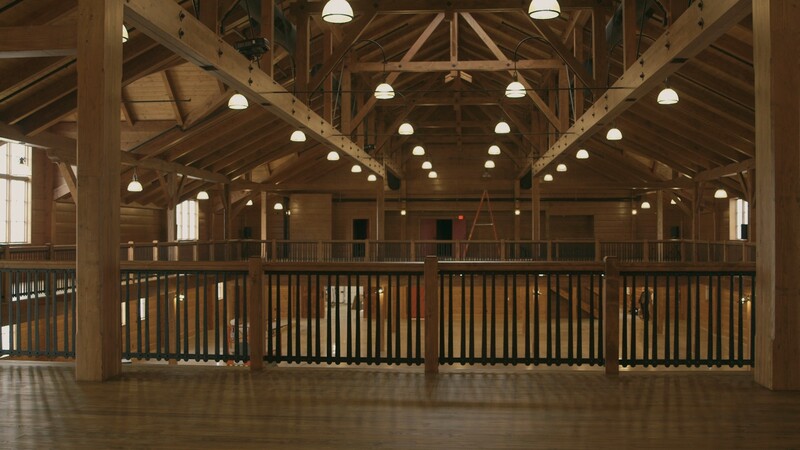 Ola paces across the beautiful wood floors and takes in the status of another big project an example of his generous outreach: an event space befitting his community and reminiscent of his spirit. Enormous wooden beams span the ceiling several stories overhead. Like a barn-home made for giants, the new space is open, expansive, and natural and says everything about Ola’s heritage and craftsmanship. He called in a specialized Amish engineering team to ensure the building’s floor was free of supports in an enormous center section. The space is a work of art and will provide a center for activities of thousands in and around the community. While the event space will be used by the community for festivals, events, and fundraisers, it isn’t the only project Ola has his eyes on. He has an unwavering passion for the next generation. And when Ola heard from Foundation president Pete McCown about the good work being done at CAPS (Child and Parent Services), he knew he had to help. As quickly as Ola learns about a new project aimed to do good, he gets himself involved. His new fund is just another tool at his disposal. As Ola walks out of Grafton Correctional, he hears the invasive buzz of gates and barred doors. The low thud of a heavy steel door separates him again from Eli. Faint clangs and muffled yells create a harsh mixture of background noise that echoes through the walls of the sterile prison. Ola knows Eli will spend the next 25 years locked in that institution. He knows much or all of his life may well be spent inside those cold walls. He also knows that his own simple visits warm the days that surround them for Eli,and that Eli has grown in the time he has spent incarcerated. He knows that no soul is defined — and certainly not lost — in its worst moment. He believes firmly in the transformative power of love…a love he expresses to his family and to his community. The most important things in your home are people. For Ola, he calls home his humble farm; his ever-growing factory; his new event center — Sammlung Platz (translated — “The Gathering Place”). He calls home Nappanee, Indiana, and the Amish community. He calls home the whole of Elkhart County, where his fund will impact the lives of thousands. He calls home the many nonprofits offering love and forgiveness. He calls home Grafton, and Eli struggling to live with the heinous things he’s done. For Ola, home extends far beyond the property line. And the most important things in his home are the people.